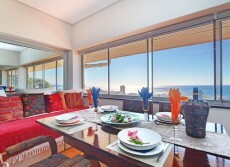 This stunning 3 bedroom Cape Town holiday apartment, with expansive views of the ocean and Lion’s Head, is conveniently located in a quiet side road off High Level Road in Upper Sea Point. It is just 10 minutes walk to the promenade and beaches, and fantastic restaurants and amenities are a quick stroll away. This contemporary and stylish apartment is very spacious – 150 square meters and can sleep up to 6 adults and we can accommodat an extra child (up to 12 yrs) on a sofa bed. The entrance opens onto the expansive kitchen, lounge and dining room which has views over the rooftops towards the ocean. The kitchen is spacious and modern and is equipped with an espresso maker, fridge, large hob & oven, microwave and dishwasher. The lounge has a large stylish L-shaped couch which faces the flat screen TV, DVD and sound system. For entertainment there is a full satellite package (DSTV). Connect your laptop to the TV and watch your iTunes films using the speedy WIFI connection. The dining table can seat 6 people comfortably and leads onto the large balcony equipped with sturdy teak outdoor furniture. The balcony has lovely ocean views over the rooftops of Sea Point. The living area leads down a short passage to the main bathroom on the left which has a separate shower and bath. The bedroom on the right has a king size bed and also comes with a sofa bed and built in cupboards. It opens up onto the balcony with slider doors and has sea views. The main bedroom with walk in cupboards also faces towards the ocean. It has a comfortable king size bed. The second bedroom’s entrance is opposite the main bedroom and it has a queen size bed, built in cupboards and views of Lions Head. This bedroom has an en suite bathroom with a shower. 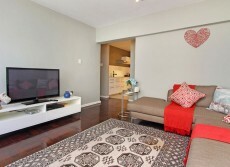 The apartment has a secure garage and there is also free unlimited WIFI internet access included. Ideal corporate accommodation for the business person or tourists looking for a comfortable and stylish base in a central area.